The location or setting of a service is key to establishing the mood and atmosphere. 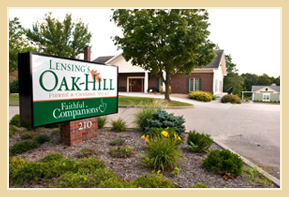 Lensing's two funeral homes provide private and comfortable spaces for funerals, memorials, and viewings. You may also choose to hold your service in a church or other house of worship, at a sectarian public space, or outdoors. Wherever you choose, Lensing's will be there to assist you along the way. How many people do you anticipate attending the funeral or memorial service? What is the feeling you want to evoke? Informal? Spiritual? Family-oriented? What settings did your loved one especially enjoy and appreciate? Do you have guests with special needs to accommodate? What time of day will both suit the goals of your ceremony and the schedules of your family? 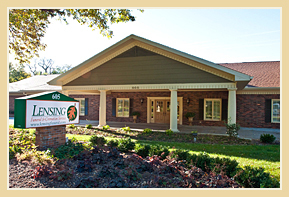 The Kirkwood Room is located next to our Iowa City funeral home in the Governor’s Ridge building. This intimate and welcoming space will accommodate one hundred people at a seated event and more for informal gatherings. The Kirkwood Room is the perfect location for a luncheon or reception following a funeral or memorial gathering and is often used for family gatherings anniversaries and other life event.